Almost every phone comes with biometric security of some sort these days, but the same can't be said of Windows computers. While fingerprint scanners are becoming increasingly common with laptops and desktops, they're nowhere near ubiquitous. Thankfully, your phone's scanner can be used as a sort-of remote authentication point for your PC. While the security of biometrics is debatable, you can't deny that scanning a fingerprint is easier than typing a secure password. I'll show you how to set up a remote fingerprint from your phone so that you can unlock your computer from virtually anywhere. Who knows — you might even want to use it as a part of your daily routine rather than typing your password or PIN all the time. To get started, you'll want to download and install the Remote Fingerprint Unlock app on your phone. Once you do that, you can move onto installing the required module on your computer with the next step below. 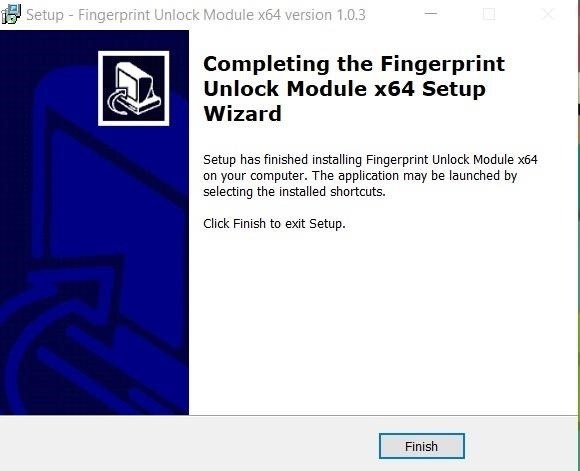 For the fingerprint app on your phone to properly communicate with your computer, you need to download and install a module that allows them to work together. From your computer, download the module from the link below that corresponds with your system's architecture type. If you are unsure whether you have a 32-bit (x86) or a 64-bit (x64) version of Windows on your computer, Microsoft has a quick guide on how to find that out. Once you have the correct version downloaded to your computer, you can move onto the next step. Now that the necessary file is downloaded, go to the location where your downloads are stored, then extract the ZIP file to find the installer package. Launch the EXE file and follow the quick on-screen guide to get the module installed onto the computer. 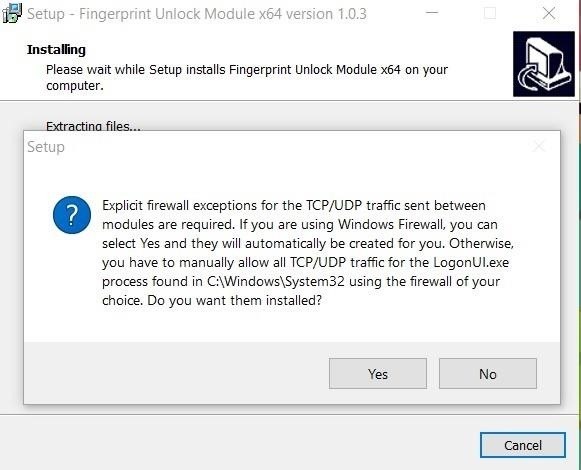 You will get a window popup that mentions firewall exceptions for TCP/UDP, just click "Yes" to grant the proper permissions required by the module. After you confirm the permissions, the installation will be completed, and you can go ahead and click "Finish." There are no individual settings to adjust with this module, so you don't have to worry about it from this point on. Before you proceed with the next step, go ahead and lock your computer so that it sits on the lock screen. Since the module only runs while the lock screen is active, you will need to keep your computer like this for the rest of the setup guide. You can either lock it from the Windows Start Menu or by pressing the Windows Key + L.
Now that the module is installed and your computer is sitting at the lock screen, you need to go back to your phone and open the Remote Fingerprint Unlock app that you installed from Step 1. From the main screen on the app, it will ask you to scan your fingerprint to generate unique keys, and once you do that, the initial config will be set. Next, tap the menu icon on the left, go to "Scan," and then tap the plus button on the bottom-right. Tap "By Scanning," and you should see your computer's name on the list after it scans the network. If your computer is not listed, do make sure your computer is sitting on the lock screen and your phone's connected to the same local network, then try again. Go ahead and tap your computer's name, and a new screen will pop up for the setup of your computer. For ease of use, just leave everything set at their default values and tap "Save." Now that your computer has been added to the fingerprint app, you will need to add your login credentials from the Windows account or user account you use to sign into the computer. Tap the menu button on the left, tap "My Accounts," and you should now see your computer listed from the previous step. From here, tap "Add Account," and then fill out the login credentials you use for the computer. Once that's done, scan your fingerprint to confirm the account, then tap "Save." Your phone should now prompt you about the session ID, which should match the number on the module from the lock screen. Check to make sure they match, then tap "Proceed" on the app to continue. If they do not match for some reason, repeat the first part of this step again. Now you're past the initial setup and are ready to unlock the computer with your phone's fingerprint scanner! From the fingerprint app, tap the menu on the left, go to "Unlock," and now scan your fingerprint on the phone like you normally would. If all went well, you should now see your computer unlock right before your eyes like magic. Pretty cool huh? This gives the fingerprint scanner on your phone a new dual purpose functionality that you might not have known otherwise. Enjoy! Should you see yourself using this setup for your own daily routine, you might want to consider upgrading the fingerprint app to the premium version for more functionality. Aside from the typical ads removal you might expect, you can get new added features like wake on LAN, multiple computers/accounts, and a cool set of widgets as well for even quicker unlocks. Imagine being able to wake up your computer from sleep mode while unlocking it at the same time with your fingerprint. 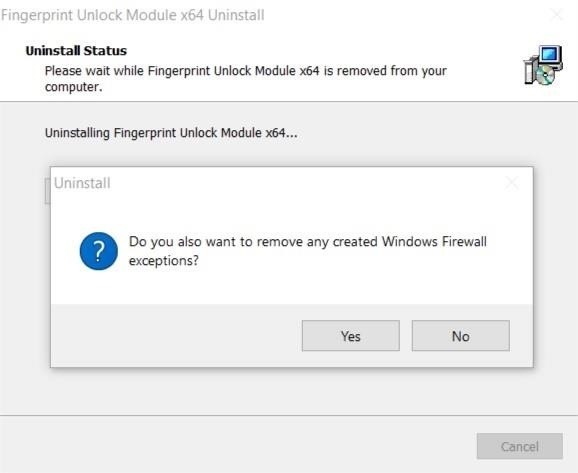 If you want to uninstall the module at any time from your computer, you'll have to do a system file search for the term "Uninstall Fingerprint Unlock Module." Once you find it, click the uninstaller, and it will prompt you about uninstalling the module. After you click "Yes," a new window will pop up asking to remove the firewall exceptions from the initial install, which you want to click "Yes" on as well. Once it finishes the quick uninstall process, click "OK" to confirm it. That's all there is to it!